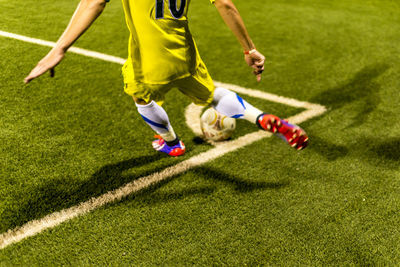 during the Qatar stars league, children are training in clubs and grown ups are playing in amateur leagues. With the time of 8.5 or 8 years to wait depending on the decision by FIFA, there is enough time to improve the football culture in Qatar and remove all the negative expectations about 2022. Qatar is a country of only 2,042,444 people (July 2013 est.) which includes only 15% Qataris. The rest is expats mainly from other Arabic countries, Philippines and Bangladesh, Nepal, India and Pakistan. With the future of Qatar, a future of expansion (4.19% growth rate), and thereby more foreigners, Qatar will be an even more multicultural country. 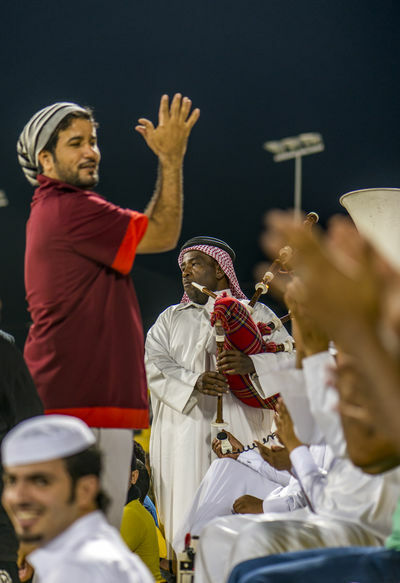 Football culture was introduced to Qatar in the 1940s and 1950s by oil workers from Europe. The Qatar Stars League (QSL) is the highest professional league in Qatari football with its first season played in 1963 and now in 2013, featuring 14 clubs with one club demoted to second. similar population as Qatar (but almost all are Slovenians compared to Qatar) had an average of 530 spectators in the 2012/13 season. 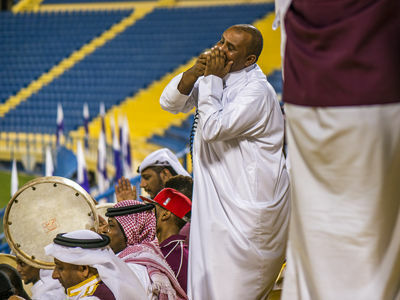 The attendance in Qatar is probably similar (if not a bit lower) but a lot more loud; as singing through a megaphone and playing the drums throughout the game are common. communities, a fan club where you get points for watching a game and is offering price bonuses at some of the games. 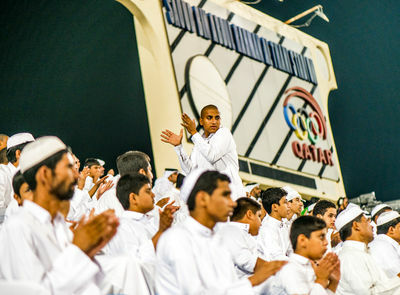 The initiatives have attracted more spectators but getting people to the stadium is a change of culture in a country where football is mostly watched at home, in front of the TV. There are mainly 3 groups of fans with their own characteristics. Sometimes, depending on the club, are all present at games. Local fans are mostly fans paid to attend the games. There are fan coordinators who coordinate the cheering, singing and clapping and who circulate among the different clubs. A band is playing local songs on drums and one or 2 fans is singing through out the whole game. Saadi Ahmed Al-Essa, a local who had paid for his ticket, at Al Sadd against Qatar SC, is going with his 2 children when there is a bigger game but he prefers to see the game in person. The Asians represent the largest group of fans at most games. Khalil Khandoker is a Bangladeshi citizen, working in Qatar for a construction company. He is a the stadium for the game with some of his friends. 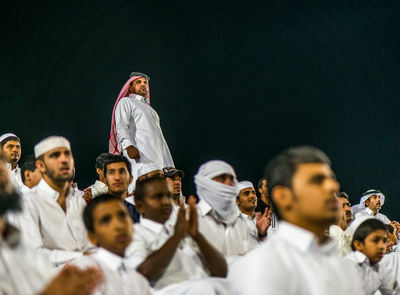 Watching football is one of the cheapest activities possible for him in Doha ( a ticket is around 3 dollars) but mostly they do get free tickets. the locals. Asians are more quiet than the other groups but still clap and cheer during the game. African spectators are coming to watch the games of the clubs with African players and if they live around one of the stadiums. African spectators are like they are at home: dancing and cheering in the most wonderful way. It seems they came to the stadium for the party and not the game. football. But the atmosphere is good and he will surely return. 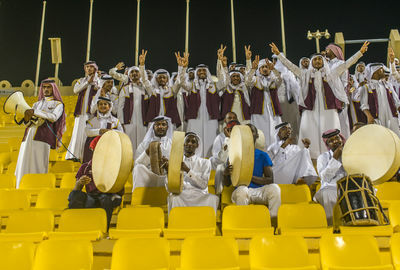 Compared to countries of similar size the Qatar Stars League has an attendance which is reasonable, and as anybody who has attended a game includes more singing and drumming from the spectators than similar crowds across the world. Qatar Stars League will never be like Premier League in England but with the interest of Qataris, expats and initiates will be an attractive experience before 2022 World Cup. Players are anxiously waiting start the game between Doha Warriors and ISL Stars in the amateur premier league at Espire football field, Doha, Qatar. 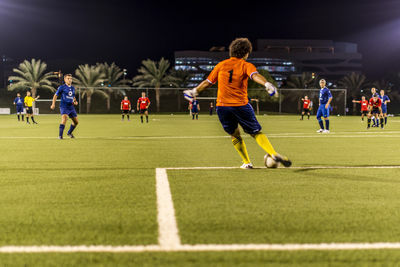 Goal kick for Doha Warriors against ISL Stars in the amateur premier league at Espire football field, Doha, Qatar. The field is surrounded by palm trees. Throw in for ISL Stars Warriors against Doha Stars in the amateur premier league at Espire football field, Doha, Qatar. Most of the team are one nationality as they have met through friendship either at work or spare time. A player is warming up among the palm trees at Espire football field, Doha, Qatar. 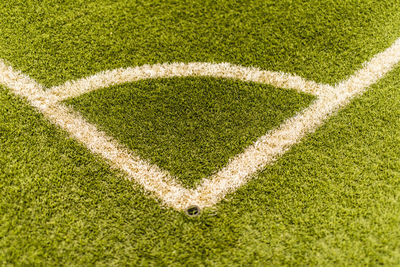 The football field is artificial and thereby perfect for planning games through out the year. 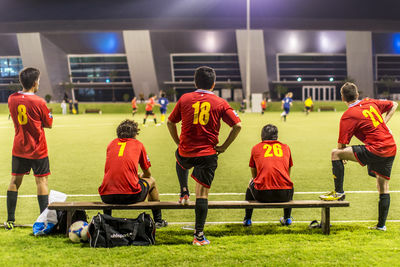 Espire football field, Doha, Qatar. 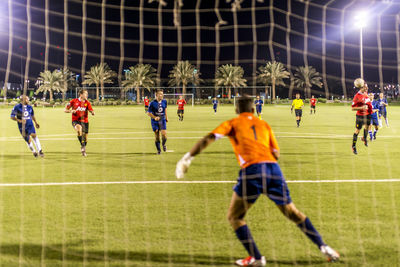 A corner for MD UTD against Guardian FC in the amateur premier league at Espire football field, Doha, Qatar. 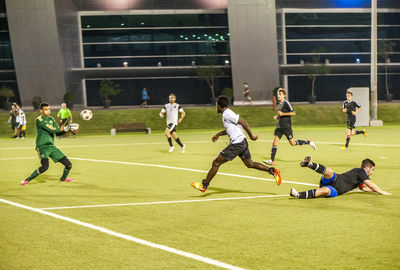 A chance for Doha Warriors against ISL Stars in the amateur premier league at Espire football field, Doha, Qatar. The level of the game is quite high with a high tempo and nice passes. A big chance for Evo All Star against Latin United FC in the amateur premier league at Espire football field, Doha, Qatar. 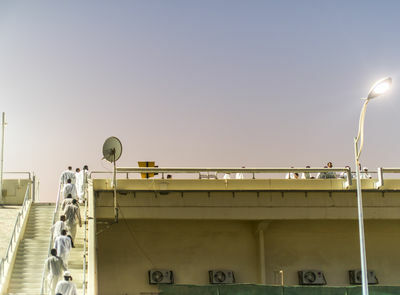 Local fans entering the stadium before Al Wakrah against Al Sadd in Qatar Stars League. Asian fans are cheering in a different way than locals and Africans. 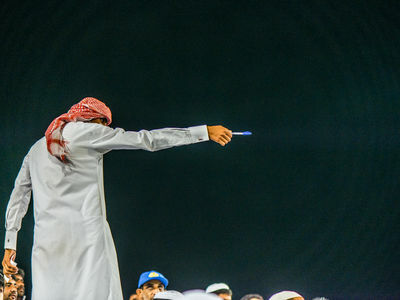 Al Gharafa against Lekhwiya in Qatar Stars League. The game ended 1-2. For the locals singing is very important. It is loud but also very rhythmic. Umm Salal agianst Al Rayyan in Qatar Stars League. The game ended 3-3. 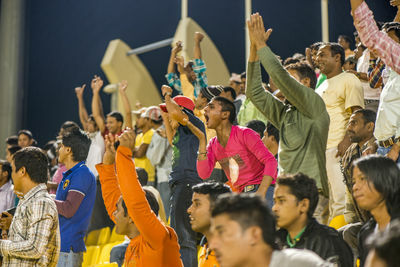 The fans wholeheartedly shout and clap after a goal. Umm Salal agianst Al Rayyan in Qatar Stars League. The game ended 3-3. A fan coordinator trying to control the crowd. Some fan coordinators move around from club to club assisting the fans and club to create the best atmosphere. Umm Salal agianst Al Rayyan in Qatar Stars League. The game ended 3-3. 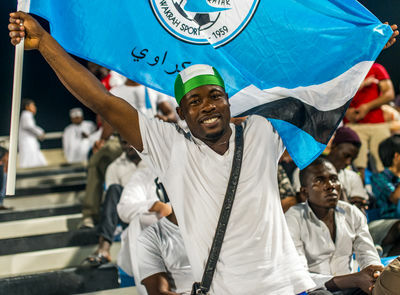 Nigerian fan of Al Wakrah cheearing during Al Wakrah against Al Sadd in Qatar Stars League. Fans watching the game closely, following each move of the players. Umm Salal agianst Al Rayyan in Qatar Stars League. The game ended 3-3. 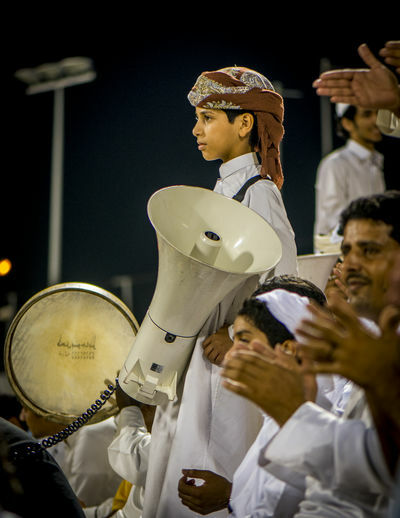 A young fan is assisting by holding the megaphone. Umm Salal agianst Al Rayyan in Qatar Stars League. The game ended 3-3. Even a bagpipe has been imported to improve the atmosphere. Umm Salal agianst Al Rayyan in Qatar Stars League. The game ended 3-3. 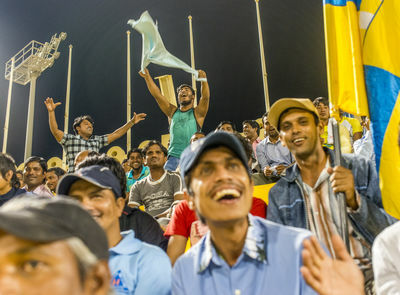 Asian fans cheering after Al Gharafa scores a goal. 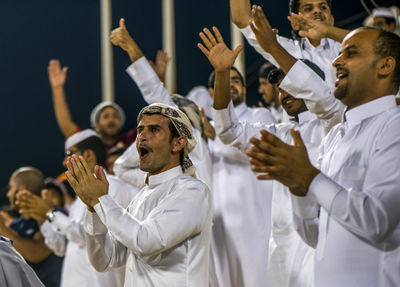 Al Gharafa against Lekhwiya in Qatar Stars League. The game ended 1-2. Fan is trying to encourage other local fans to clap and make as much noise as possible. Umm Salal agianst Al Rayyan in Qatar Stars League. The game ended 3-3. With the hard work of fan coordinators more and more peple are participating in directing and coordinating the fans. 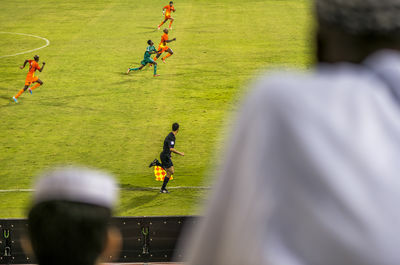 Umm Salal against Al Rayyan in Qatar Stars League. The game ended 3-3. Fans are following the action on the field closely. Umm Salal agianst Al Rayyan in Qatar Stars League. The game ended 3-3. . Fans are singing and playing music with passion during the game. Muaither against El Jaish. The game ended 2-4. 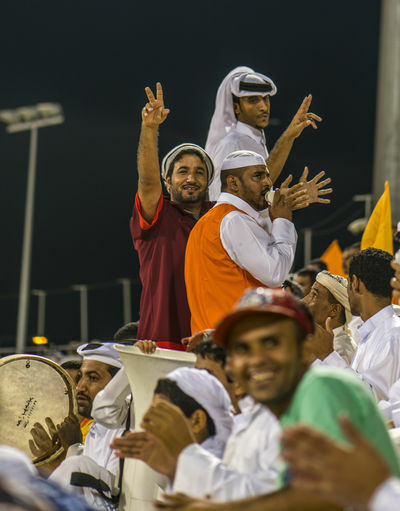 The fans are celebrating after their team, El Jaish, has secured the victory. Muaither against El Jaish in Qatar Stars League.The game ended 2-4. Both groups of fans are located on the long side of the station leaving both ends empty. 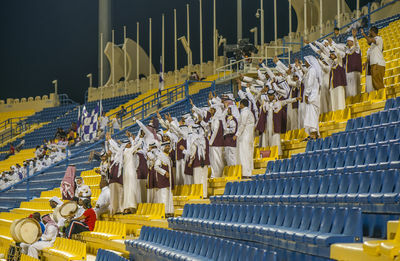 Muaither against El Jaish in Qatar Stars League.The game ended 2-4. 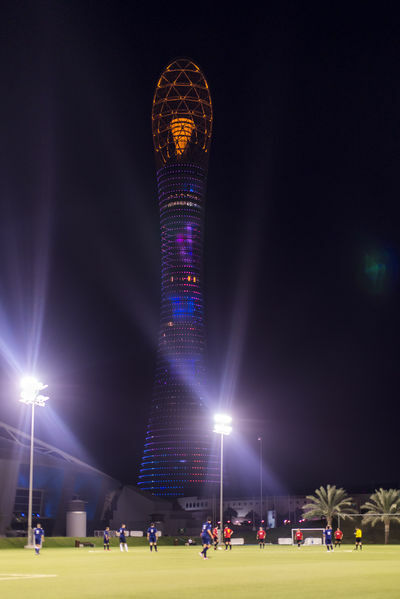 The aspire tower is majestically located behind the Espire football fields in Doha, Qatar.